Labradoodle Health is our Top Criteria! Click below to find more information on our Labradoodle puppies. To bring families an exceptional labradoodle, exceptional in labradoodle health, temperament and conformation. 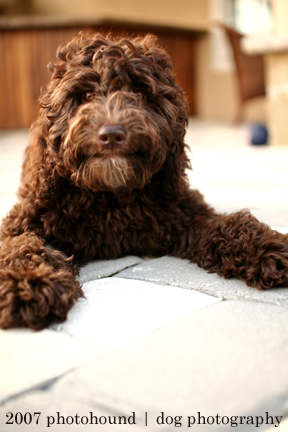 Do Labradoodles have health problems? Yes, all dogs have health problems. Mixing breeds does not, on average, make a healthier dog. Yes, if you mix two purebred lines (only once) any genetic issue that requires a pair of alleles (one from each parent) and NOT present in BOTH breeds will be negated in that first breeding. However, Poodles, Labrador retrievers and Cockers (English and American) all produce, at times, concerning health issues. These are all screen for by good breeders and include hip dysplasia, eye issues, heart issues and cancer. Currently Paw Print genetics offers a batch of DNA tests for the Australian Labradoodle and Labradoodle parent dogs, OFA offers tsting for Elbow and Hip Dysplasia, CERF offers eye testing (beyond those in the Paw Print Panel), and Heart Screening is recommended. Screening parents will negate, or reduce (non genetic tests) these health issues in offspring. What can we do to ensure a healhy Australian Labradoodle? We select only the healthiest of labradoodle parents, grand parents and great grand parents for your labradoodle puppy. We have completed ALL the canine expert suggested health testing on ALL the generations of your labradoodle puppy to ensure a lifetime of health. We will both provide you education on the breed and any health issues commonly occurring in this breed, AND health test the parents and line of your puppy to ensure these issues do not present themselves in your health labradoodle puppy. Please, never purchase a labradoodle or Australian Labradoodle that does not have health (including genetically) tested parents and if possible comes from a superior genetically tested line, plus a health guarantee. You will receive a vet healthy puppy report including shot record with your new puppy & a three-year health guarantee on hips HD, plus two years on VonWilabrands, Elbow, & patella disorders etc. We have our breeding parents checked for HD (hip dysplasia), Elbow (elbow dysplasia), & are OFA (prelim or final) to ensure the lowest possible genetic passing of these disorders. In addition, annual CERF/ACVO eye exams and the Paw Print genetic DNA screen tests for all parent breeds are completed. I will have to say the best book I have studied on genetics and health is Control of Canine Genetic Diseases, renowned authority George A. Padgett, DVM. First, I would like to state that the MAIN reason for selecting breeding dogs that are a top representation of their breed (Poodle, Lab, Labradoodle or Australian Labradoodle) in Health, Temperament, and Conformation is the resulting puppies are top in health temperament and conformation. There is NO QUESTION; a puppy is a direct result of its parents and pedigree. The issues here are best described by an expert, Joanne Reichertz DVM in her 2004 article "Oodles of Poodle Crosses for Sale"
"In virtually every newspaper classified section you can read, there are advertisements for Goldendoodles, Labradoodles, Cockapoos, Pekeapoos, Shihpoos, etc. In all the years I have bred poodles there have always been crossbreeds around. Most of these were accidents and the puppies were given away or sold for little more than the price of their care. Some Cockapoos were deliberately bred for Pet Shops, but the market was inconsistent, so they were not readily available. Labradors and Standard Poodles were also crossbred in Australia to produce a specific type of working dog. However in the previous few years the “fad” has been to produce crossbred poodles with many different breed and market them for considerable money as “designer breeds that are healthier and otherwise better than a purebred”. In most cases these puppies are produced for monetary gains not to develop a new breed! The Goldendoodle is one of these crossbreeds. Goldendoodles were deliberately bred in North America as a larger version of the Cockapoo, beginning around ten to fifteen years ago. Most do not shed hair heavily, and some are hypoallergenic like the Standard Poodle. This crossbred gets its name from the mix of the two breeds - Golden Retriever and Poodle. Goldendoodles are considered a hybrid dog, a first generation cross between two breeds, and as such they are supposed to exhibit a quality called hybrid vigour by these breeders. This hybrid vigour is more correctly called heterosis. Crossbreeding in commercial beef cattle production improves feed efficiency through heterosis. Hybrid vigor or heterosis is the added performance boost in crossbred calves over the performance average of their purebred parents. This heterosis can be used to advantage where the end product is meant to grow faster and eat less feed while doing so – thus maximizing the farmer’s profit. It is not necessarily useful in breeding dogs. In theory the puppies will take on the best traits of both breeds. In reality, this is often false. A breed of dog is not a separate species, it is just a family of dogs bred to exhibit certain specific traits like the coat of a poodle. When you breed a litter of purebred dogs you get predictable puppies. With crossbred puppies you do not. It takes many generations to fix traits when developing a new breed. For example after a hundred years of breeding the Toy Poodle we still get the problems of oversized individuals, long backs/short legs and soft coats (particularly in white) – all leftovers from the breeds originally used to produce the Toy Poodle. Crossbred dogs such as the Goldendoodle or Cockapoo are NOT hybrids nor are they a breed. Cockapoos may look like a Poodle, a Cocker or somewhere in between. A Cockapoo bred to a Cockapoo is not a breed. It takes decades or more to get a new breed to “breed true” without throwbacks occurring. People backcrossing Goldendoodles to Standard Poodles or crossing them on each other cannot predict the looks, coat and personalities of the resulting offspring. It will take many more generations before this will be possible. In addition when they breed them to each other they lose they slight health advantage which may have been gained through heterosis. These are still dogs and now we will have dogs with the health problems of both breeds. Hip Dysplasia, being present in both breeds can show up in first generation Goldendoodles, so parents should be screened. In conclusion, while I know it is possible to develop a new breed such as the Goldendoodle, with careful selective breeding practices and health testing, many people are breeding these dogs simply for monetary reasons. They often have no regard for the health and well being of the puppy produced and as a result these breeds are becoming a common commodity in animal shelters as well as in newspaper classified advertisements." How many years do Labradoodles live? The average life expectency is 12-16 years. If you feed them top of the line, grain free nutrition, avoid over vacinnating (do titer tests), avoid internal pesticides and purchase a puppy of genetically screened and health tested parents your Labradoodle or Australian Labradoodle can live a long health life. We have been breeding since 2002 and our many of original litter is still with us AND healthy. I hope you have read this information and understand that while those of us health, temperament, pedigree and conformation testing our parent dogs, grandparent dogs...are doing the best we can to produce healthy, well tempered dogs, true “hybrid vigor” is just not a correct term for the result. Why? Because, one, those breeding purebred poodles with the same selection criteria and careful not to inbreed can also produce the same healthy, well tempered puppies. And two, since labs and poodles are of the same species, the true form of hybrid vigor does not apply. For the remainder of this section I will use "hybrid vigor" as a loose term to describe breeding two dogs of different breeds. 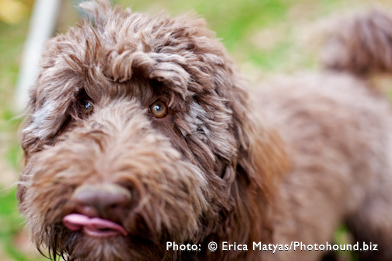 Some breeders use this term to sell you on Doodles or mixed breed dogs. To be honest there is only health concern where I am sure the first generation cross of a lab and poodle results in (this modified definition of) “hybrid vigor” and that is SA. Other health concerns (Hip Dysplasia, Elbow Dysplasia, patella Luxation, heart conditions, eye conditions, Addison's) are present in both breeds and therefore cannot simply be bred out by combining the two. When pure bred dogs are bred the lines are crossed over and over, possible negative and/or positive genetic traits are reintroduced again and again. If line or inbreeding is practiced possible negative genetic traits are reintroduced at even higher rates. Typically for a disease like Addison’s disease to be expressed in a dog it requires the genetic trait to be passed by both parents. If it is only passed by one parent the trait is recessive and the dog never shows any signs or symptoms of the disease in its lifetime. Therefore, if a breed like the poodle has been known to carry SA (a skin condition) and a breed like Labrador is known not to carry SA, then the first generation breeding of these dogs cannot express SA. This is a positive health affect of “hybrid vigor”. Once a Labradoodle is bred to another Labradoodle or another Poodle in this specific case of SA, the “hybrid vigor” influence is diluted. Only by using dogs that are known not to have SA can you remove SA from a line and that can be done through careful breeding strategies. The primary reason to advocate for “hybrid vigor” is temperament. For generations pure bred dogs have been inbreed and line breed to reduce size or create the perfect conformation standard. Or another dog was selected as a breeding dog specifically due to its size of conformation, its ability to produce smaller offspring or win in the show ring over temperament was the concern. This has lead to poor temperament offspring in general (the same reasons human brothers and sisters cannot marry). The out crossing to unrelated lines, if selecting breeding dogs with temperament as top criteria, begets top temperament puppies. Yeah for “hybrid vigor”. Furthermore it has been proven that, in general, the more unlike (heterogeneous) two animals are the more healthy their offspring. On the flip side, if both breeds carry a disease “hybrid vigor” (healthier offspring than the parents) does not apply. This is why health testing breeding dogs is so critical. Health testing breeding dogs costs about $1000 to $1500 per dog, but is NECESSARY for a breeder to know what they are producing and to support a positive step in reducing health incidents in Labradoodles and Australian Labradoodles. Diseases that are of concern to Poodles, Labs and all other breeds used in Australian Labradoodles are Hip Dysplasia, Elbow Dysplasia, Heart conditions, Eye conditions, Addison's and Thyroid Conditions. All breeders should be testing their breeding dogs by completing Hip and Elbow testing (either OFA, PennHIP or BVA test), Heart Screening, Eye testing (CERF or other), and Complete CBC with Thyroid panel before breeding a dog AND removing those that do not pass these tests from their breeding program. 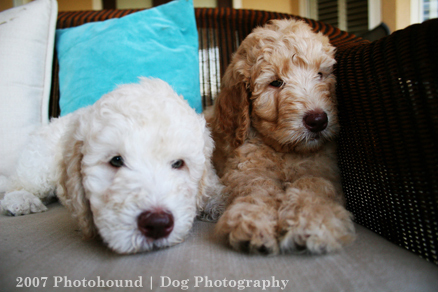 (c) Copyright Rainmaker Ranch Labradoodles, all photos and content.